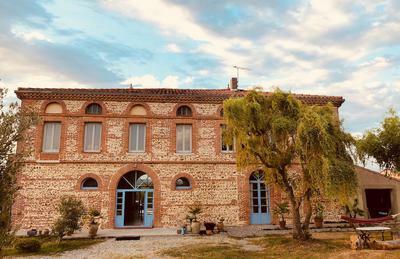 A beautiful 23ha farm with Toulousaine style farmhouse (6+ bedrooms) in the countryside just outside Toulouse. 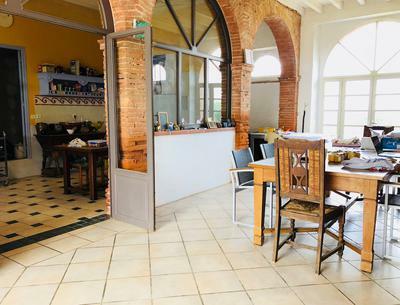 3kms from the town of Saverdun situated alongside a beautiful river, with all services including hourly trains to Toulouse and nightly train to Paris. Very accessible to the Pyrenees for skiing and trips to Spain. The house is perfectly habitable with room for renovation if desired. The rooms are large and light filled. The ceilings are high both upstairs and downstairs. The farm consists orchards, fields and woodlands. The land completely surrounds the home and buildings in a complete parcel. The land is pristine and has not been commercially farmed for many years. 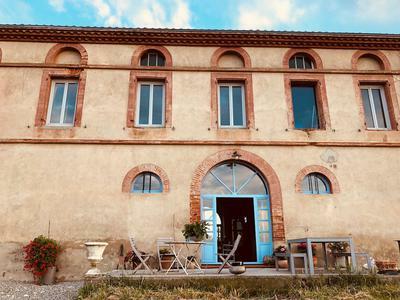 This property could be transformed into a small working organic farm, horses, gites, a venue for activities such as a meditation yoga retreat, an executive conference and getaway venue. This property has existing planning permission to be run as a commercial property such as hotel, gites, venue, etc... It is of course, and has been for us, a delightful family home and an ideal place for children and pets. We have had so many beautiful times here and many, many visitors who love the ambience, space, light and surrounding countryside. Due to family committments in Australia, we must downsize our property in France and we are very open to negotiation concerning the price and also the amount of land sold with the house. We are open to selling the house with less land if desired. mallet.cats@wanadoo.fr for further information. We speak both English and French. We can send more photos and information as desired.